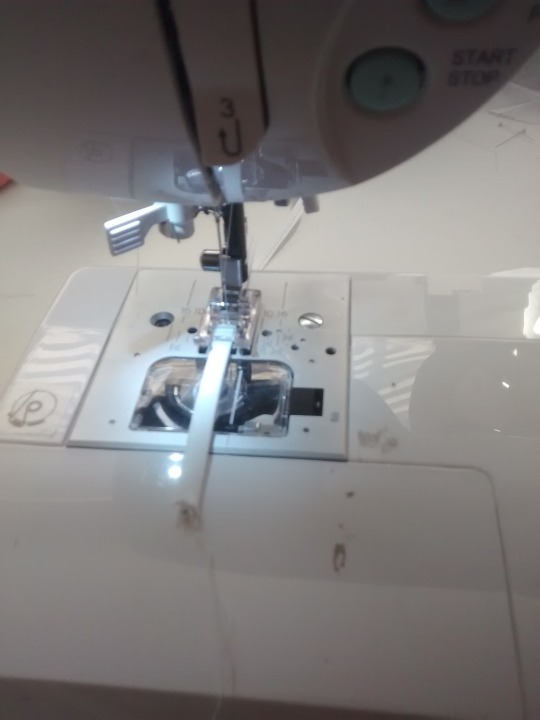 This is the blog of a girl who one day decided to learn to sew. I've been unmotivated, as you can see. No blog posts, no updates, nada. I've been taking care of my toddler who is now special needs. He gets home therapy two times a day every day of the week. So my only sewing time is at night or on weekends. I promise to try to do better. I'm working on something right now and I'm nearly finished. It's a pair of stays and it has boning channels, lining, and straps. All it needs is bias tape, boning and grommets and then it's done. I've been writing notes and keeping a project diary which outlines what I worked on and what days, so hopefully within the next week, my stays are completely done. Then I'll do a thorough write-up about the making of them. Wow, it's been a really long time, hasn't it? I've been spending my evenings and weekends sewing. 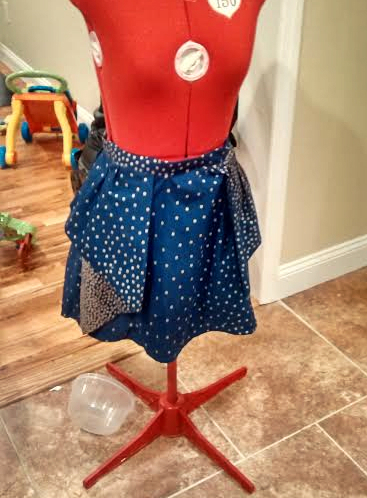 During Snowmaggedon '16, I decided to make a skirt. Enter Simplicity 1690. I bought the fabric from Fabric.com, and it's Michael Miller confetti dot border print. It's a lovely mid weight cotton, but by the time I sewed all the layers together, it felt heavier. For that reason, I would suggest using a light to mid weight fabric and a walking foot. Even though I trimmed seams to reduce bulk and used a heavier needle, my regular presser foot was not having it. The walking foot made it much easier to sew and sewed through all the layers with no problem. I also opted to use silk organza in place of lightweight fusible interfacing, as I hate fusible web. Ir's a pretty easy pattern, I was able to sew it together in three days and I opted to hand sew the zipper in the back because I greatly dislike inserting the with a machine. The instructions were clear and concise. I highly recommend it. I haven't updated in a while, eh? Life has been busy. 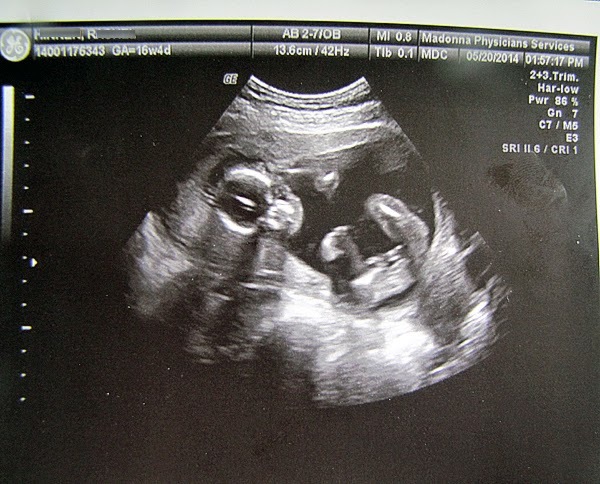 My son is a year old and I have been having health issues. In fact, I'm going to the hospital early tomorrow morning to have an electrophysiology study done and an ablation if necessary. I am working on something though, so hopefully in a week or two I have something to show off. Alright ladies and gents. Grab a snack and be prepared to read about the making of my 18th century pocket hoops. I used Simplicity 4092. First, I cut out the pattern pieces and then marked them. There’s three boning channels per pannier. Then I pleated the tops of both pieces, both the left and right sides. After pleating, I stitch bias tape to make ties. 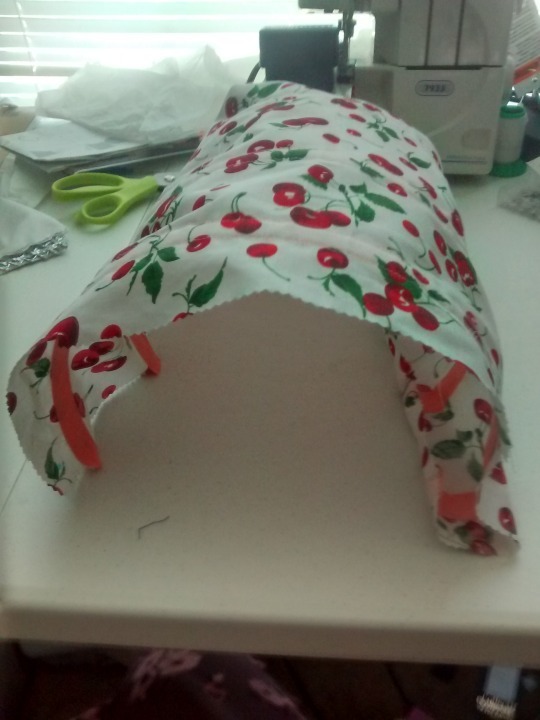 I sewed down the folded edges, then attached them to the panniers. Two ties per side. 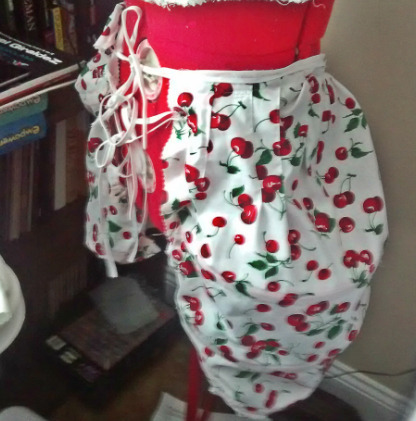 Then I added ties for the top, so I could tie the panniers to my waist using bias tape again, and voila. The pattern was easy...until I got to the part where I was supposed to attach the pannier side/bottom to the main fabric.. It took some SERIOUS fiddling to get it to work. And as a result, I am unhappy with the final result. I know it’s an undergarment, and no one will be able to see it but me, but eh, I’d rather try another pattern just to see if it comes out any better. My friend invited me to a retro night at a local fondue restaurant. 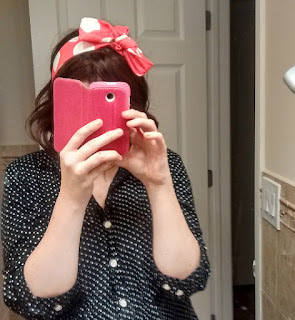 Having nothing vintage or retro in my closet, I bought a dress and shoes from Modcloth. 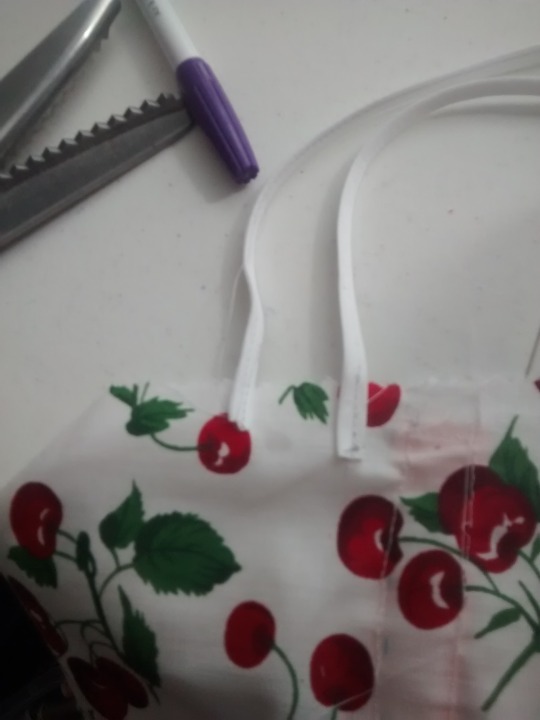 I then bought cherry print fabric and cotton webbing, and made myself a tote. It was simple enough to make. I am going to make a WWE one for my friend, since she loves wrestling so much. 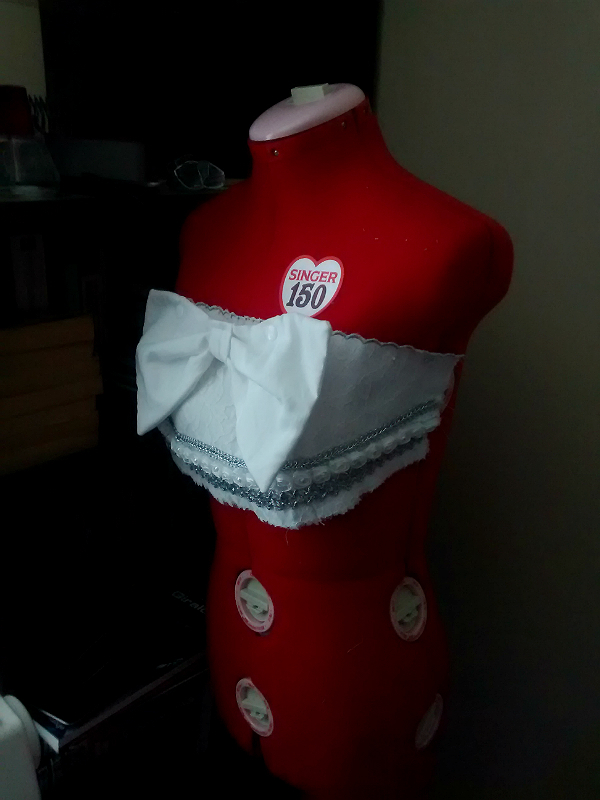 Since I am finally getting a/c installed next week, I'm going to finish my Sailor Moon cosplay. I need to embroider the bottom, attach the back bow, install snaps, and attach the skirt to the bodice. My sewing room gets quite hot so I took advantage of the cool weather yesterday and made the tote. 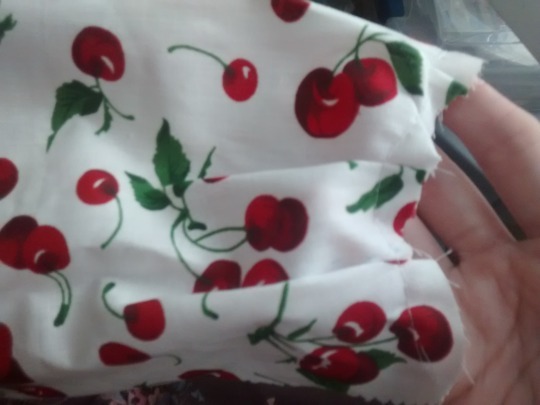 After my cosplay is finished, I'm going to make a 1940's blouse, a pair of sailor shorts, and an 18th century ensemble which includes a chemise, pocket hoops/panniers, stays, and a robe a la anglaise. I thought it would be a quick and easy project to do while waiting to finish my cosplay. My cosplay is almost complete. I need a garment steamer to get out all the wrinkles. Then I have to serge the hem skirt, embroider the bottom, and line it. I chose pink cotton fabric with large white polka dots. The book has several projects and comes with patterns. I hope to complete them all eventually. I would absolutely recommend the book to everyone, especially beginners. I cut out four layers. There is one layer of cotton sateen, a layer of lining, a layer of interfacing, and a layer of lace. I sewed the interfacing to the cotton sateen. Then I pinned the other layers to the interfaced one and basted everything together. I then sewed the bodice pieces together at the front panel seams using regular stitches and unpicked the basting. Then, I used a metallic needle and thread and made scallop stitches. I cut as close as I could to the stitching line. 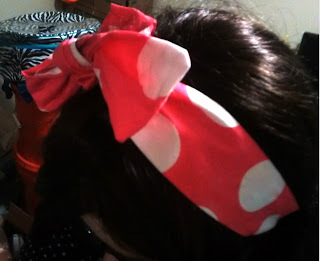 I made the bow out of two layers of sateen and heat n bond heavy interfacing, plus a little fabric for the knot. Finally, I took my trusty snap pliers and used snaps to adhere the bodice to the bow. Due to the thickness of the bow and bodice, sewing the edges did not work. Overall, I'm happy with it. It looks so much better in person, and the camera doesn't capture how freaking cool the metallic thread looks. I'll get to working on the skirt in a week or two. It's going to be a real doozy, but the whole thing will look amazing when it's done. Edit: decided to add some bling. Three rows of bling, to be exact. 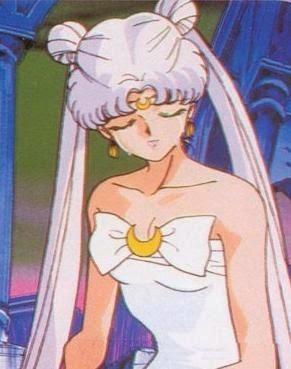 A hybrid of Princess Serenity and Queen Serenity from Sailor Moon! I started watching Sailor Moon when I was 10 years old. I was in middle school, and I'd watch the show while getting ready for middle school at six in the morning. In high school, Cartoon Network started airing the show in the afternoons so I'd watch it religious at 4:30 pm every week day. I thought it would make for a cool Halloween costume. It's going to be a strapless empire waist gown with lace and a scalloped edge on the top of the bodice made out of platinum metallic thread, with cotton sateen and an underlining. 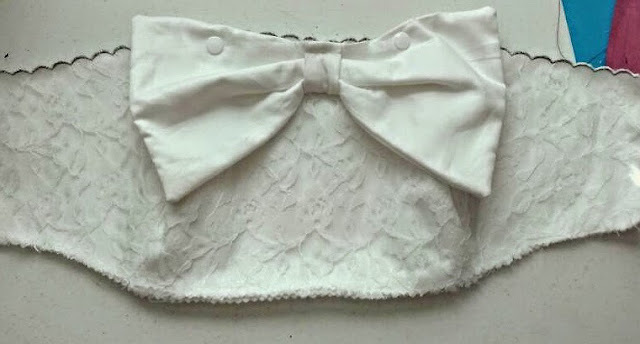 The bodice will also get a chest bow which will be made out of cotton sateen and crystal organza. Because of the bows, I opted not to do the beading on the bodice. There will be trim, though. 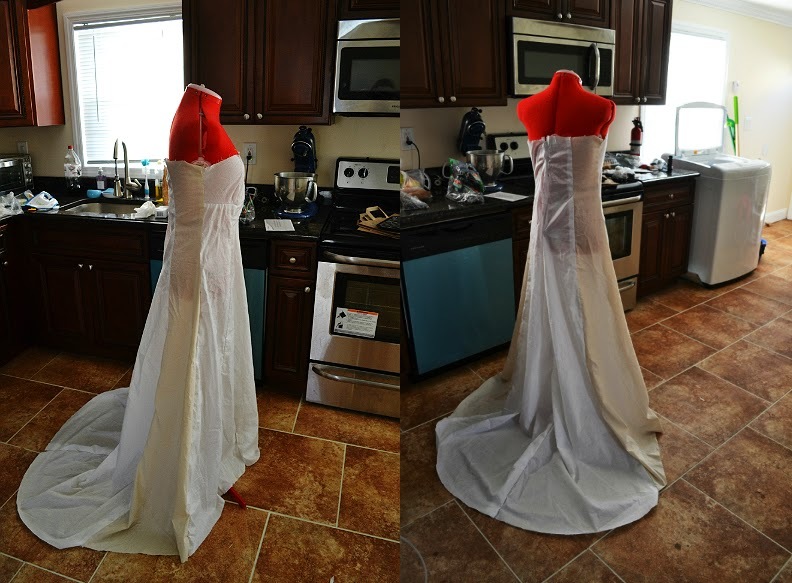 The skirt of the dress will have cotton sateen, a layer of crystal organza, and will be lined. The back of the dress will get a bow made out of the same materials as the chest bow. The dress will close at the side with snaps. The bows will be attached via snaps as well. I already made a mockup and it needed absolutely no adjusting, which is a first. The pattern is Kwik Sew 3400. The skirt panels are a bit of a pain to put together due to how big they are. When I make the actual garment, I'm going to go slow and work on it during the weekends. I take care of Oliver during the week while my boyfriend works. And with the layers of lining, main fabric, and organza overlay, I have to cut each skirt panel three times. It's going to be a lot of work but will look amazing when done. I haven't updated this site in quite some time. That's because I had my baby boy on October 17th, 2014, then bought a house with my boyfriend and moved at the end of January. Now that Oliver isn't a newborn anymore and sleeps 12 hours a night without eating, I can do more. I'm still unpacking but I have my sewing machine and supplies out. I'm itching to get back into sewing, so expect some things within the next month. 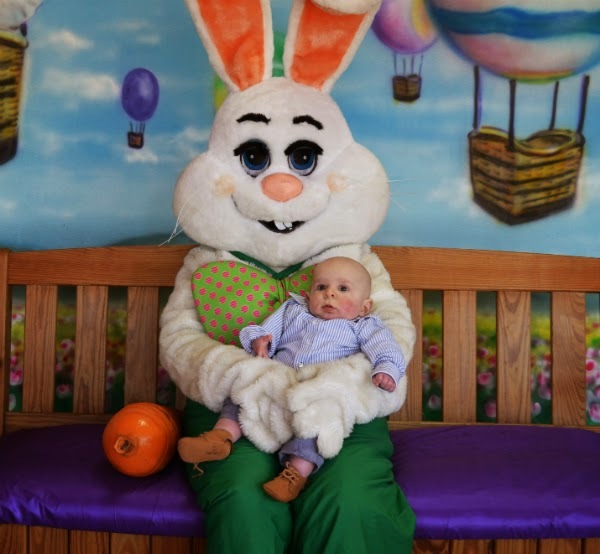 I took Oliver to see the Easter bunny. It was a great day. I can't believe the last time I blogged was in February! Sad to say, I haven't sewed at all. I'm going to miss NYCC, the ren faire, Halloween this year. I won't have a costumes and I haven't sewed anything because I know I am just going to outgrow whatever I make. I've already gone up two cup sizes and went from a 34 to a 38 band size. Plus all of those events are at the end of my pregnancy. 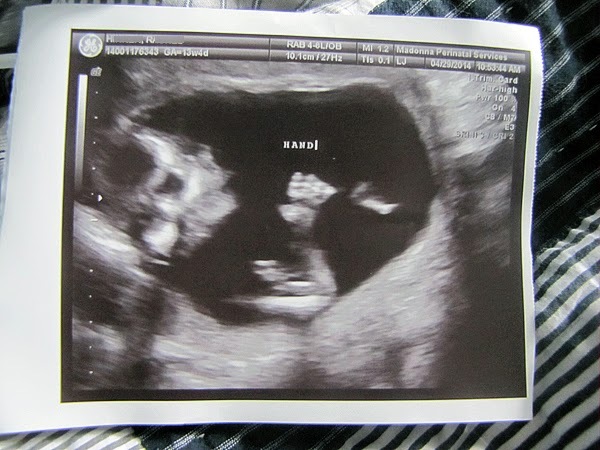 I'll probably be uncomfortable, and babies rarely come out when they're supposed to. The last two will be used for a period twist on Belle's yellow ball gown from Beauty and the Beast. 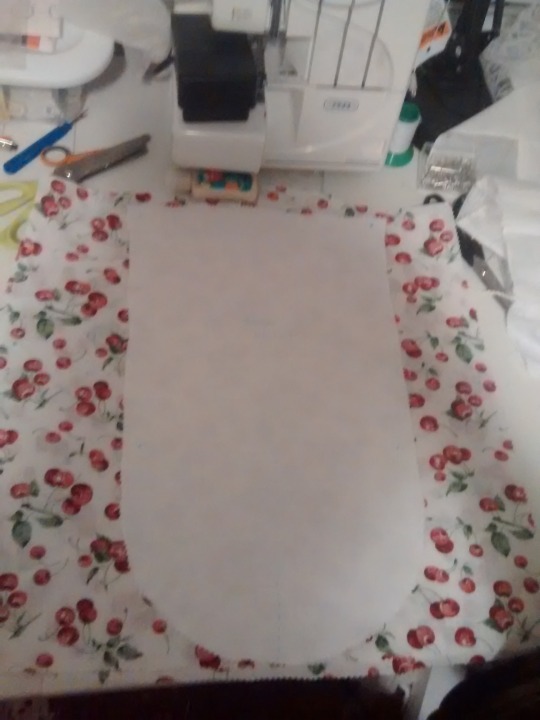 The first two patterns will be used for Christine's Elissa skirt from The Phantom of the Opera. 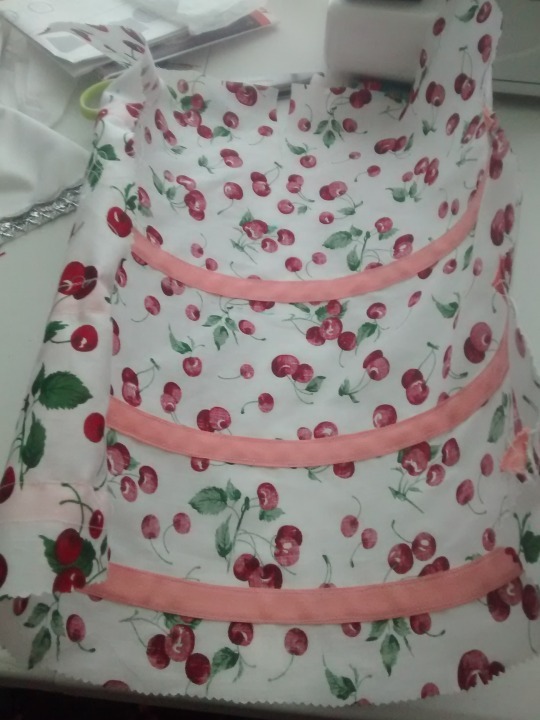 I am going to try to combine the first two TV patterns so that I get the underskirt I need, but also get the nice back panel featured in the first pattern. I still plan to make all of the other costumes I have planned. I'm confident that once I have the baby and get a routine going, I'll find the time to sew. I know newborns and infants are pretty demanding, but I won't be doing everything on my own. My boyfriend has been really supportive and I know he'll help me out.